McDonald’s introduced the new Bacon Clubhouse Sandwich nationwide, offering customers a new, premium sandwich experience. 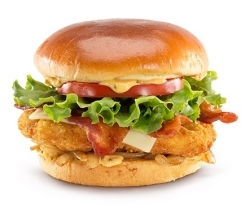 Loaded with layers of hearty toppings, a new artisan roll, a choice of a 100 percent pure beef burger or grilled or crispy chicken and Big Mac special sauce, the new Bacon Clubhouse is the first sandwich offered nationally, to include McDonald’s famous special sauce since the Big Mac. For more information about the new Bacon Clubhouse Sandwich and McDonald’s full line of menu choices including nutrition information, visit www.McDonalds.com. © 0683 Chicago Hispanic Newspaper, Lawndale News, Hispanic Bilingual Newspapers, Su Noticiero Bilingue. All rights reserved. XHTML / CSS Valid.